Feeding a large number of people when you only have one small oven and four burners can be a bit of a challenge. As our family gatherings normally mean dinner for ten I’m constantly trying to think of meals and recipes that can feed that amount of people without too much stress or pandemonium in my small kitchen, which by the way is right by the dining table so there’s no hiding any mess! This recipe fits the bill perfectly. The red wine sauce is fantastic and it’s the only part of the dish that takes any amount of time, but I normally make this the day before, you could even make it a week before and freeze it. 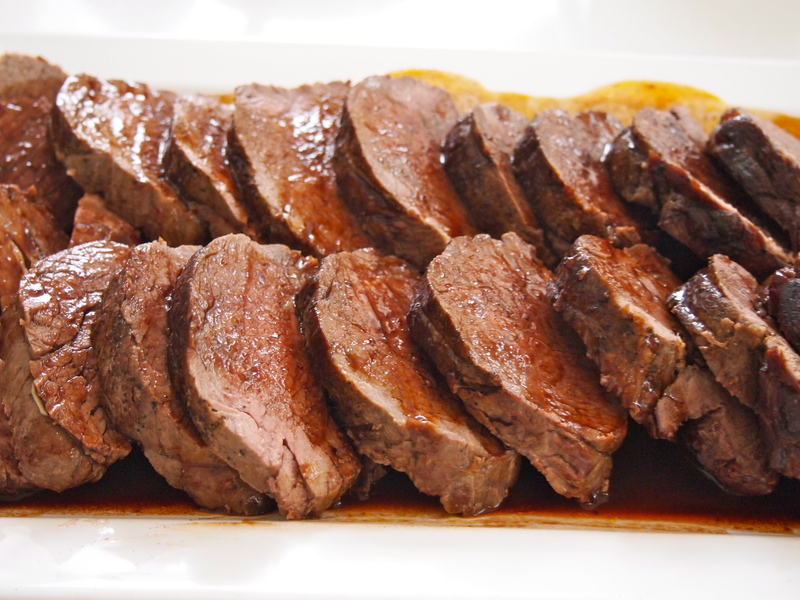 The beef fillet, or tenderloin as it’s referred to in the States, is completely hassle free. Most of my family like their meat well done so to the chagrin of my husband the beef fillet was in the oven for about 35 minutes and came out just on the border of well done. Any other cut would’ve resulted in tough meat but luckily beef fillet is very forgiving and it was still moist and tender. If I was cooking for ourselves I would cut the cooking time to 25 minutes for a nice medium-rare. The sauce takes the dish to another level and I like to spread some of it on the platter and then place the thickly sliced beef fillet on top and then pour over a little more sauce to just coat the meat a little. A whole eye fillet with a couple of side dishes fed all of us and the kitchen remained in tact! To make the red wine sauce melt 3 of the 5 tablespoons of the butter in a large frying pan and add the onion, carrot, celery, mushrooms, rosemary, sage, bay leaf, and peppercorns. 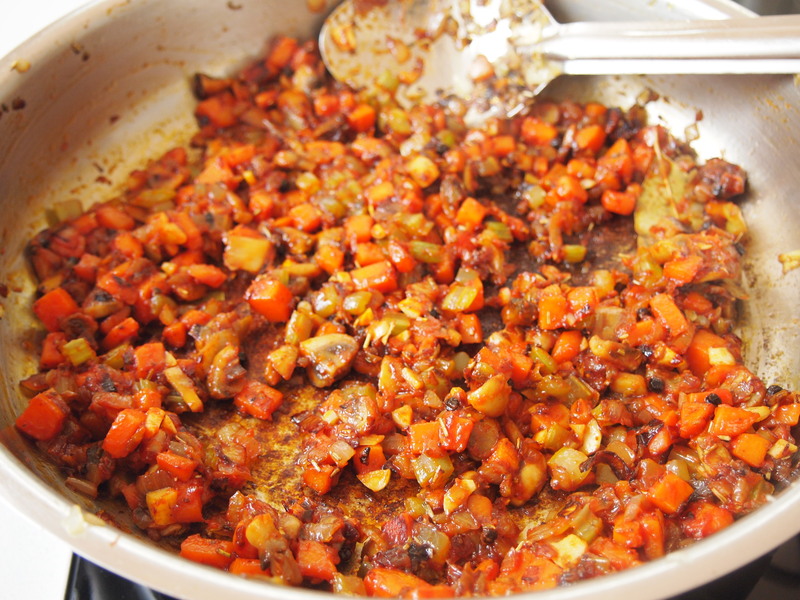 Cook over medium-high heat, stirring occasionally, for about 20 minutes or until the onions and other vegetables are browned and caramelised. Add the garlic and cook for another 2 minutes. Add the tomato paste and cook for about 3 minutes, until it begins to darken. Add the wine and the beef stock, scraping the bottom of the pan to release any residue from the vegetables. Boil for 30 minutes. Pour everything through a strainer into a saucepan, and squeeze the juices through the strainer with a ladle. 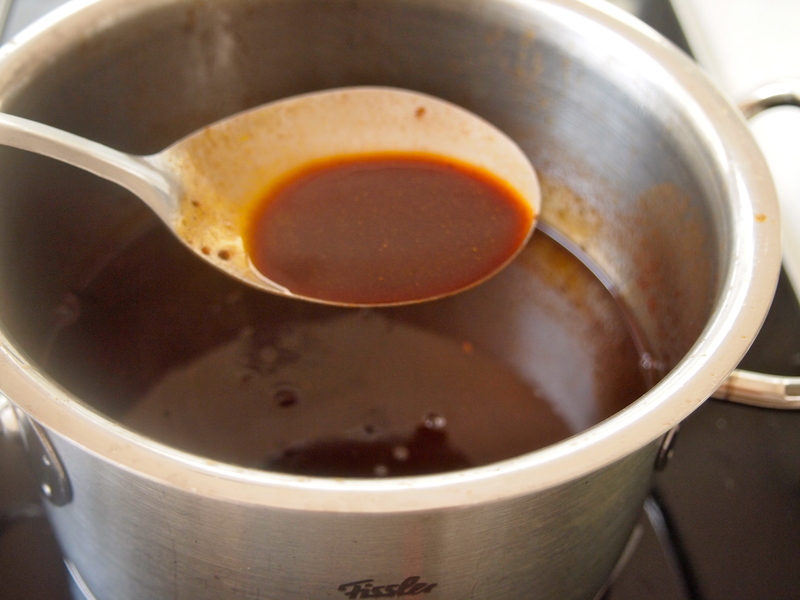 Boil over high heat until it is reduced to about 1½ cups. If you like you can reduce it further to 1 cup for a more concentrated sauce. Add the redcurrant jelly and stir until it is thoroughly dissolved. Turn off the heat, taste and season with salt and pepper if necessary. 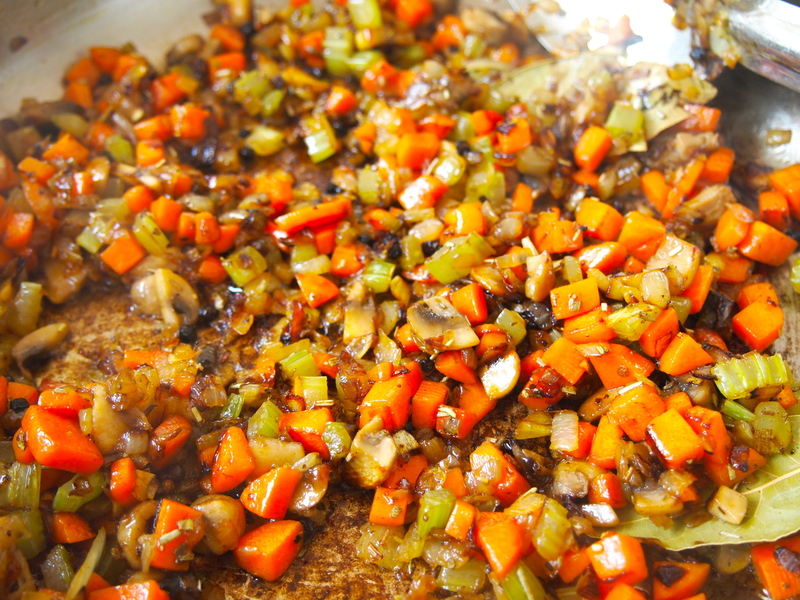 You can make the sauce to this stage a day ahead or even earlier and refrigerate or freeze it. When you need the sauce, warm it and add the remaining 2 tablespoons of butter. Swirl the butter around in the sauce with a spoon (don’t whisk it) until it’s thoroughly melted. To make the beef, trim the fillet of the long strip of silverside, if it hasn’t already been removed. 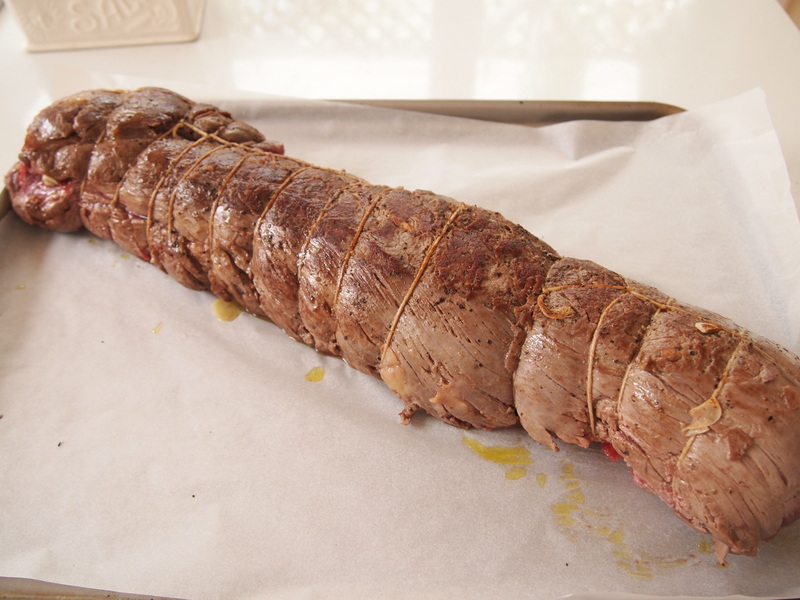 To gain a uniform shape and assist in the meat cooking evenly tie the fillet at 2 cm intervals with kitchen string, tucking in the narrow end section under the beef to create a uniform log shape. Season the meat very well on all sides with salt and pepper. Rub with some olive oil and massage the garlic into the meat. Leave to rest in the fridge for a few hours, or overnight if possible. Preheat the oven to 200C. 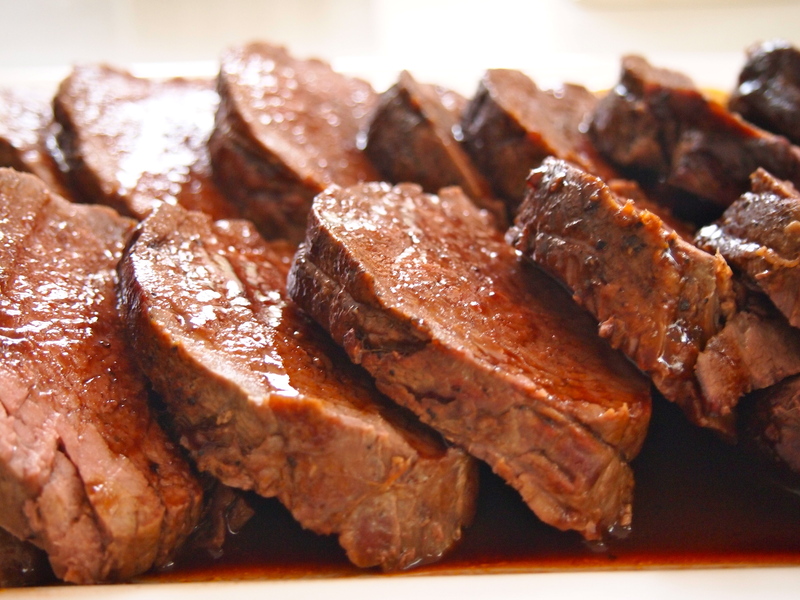 Bring the beef to room temperature and heat a large frying pan over high heat. When hot add the beef fillet and sear it on all sides until browned all over. If you don’t have a pan large enough to fry the meat you can also sear it on the barbecue. 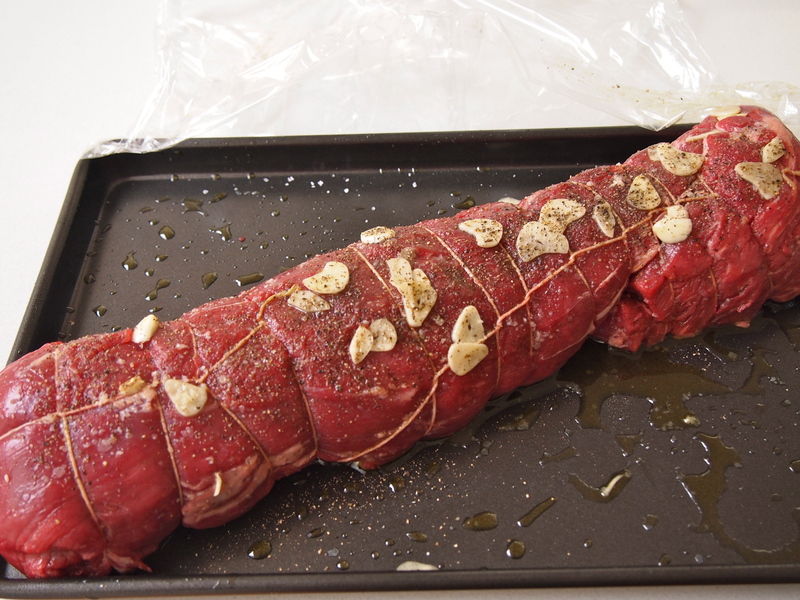 Place the beef on a narrow sided baking tray and place in the oven. Immediately turn the heat down to 180C. Cook for 25 minutes for medium rare, 30 minutes for medium and 35-40 minutes for well done. If you have a meat thermometer the temperatures you’re looking to achieve are: For rare meat 55-57C. For medium rare, 60-62C. For medium, 68-70C. For well done 75C or above. As oven temperatures vary so much it’s a good idea to check the temperature of your meat after 20 minutes of cooking time and then every 5- 10 minutes after that. 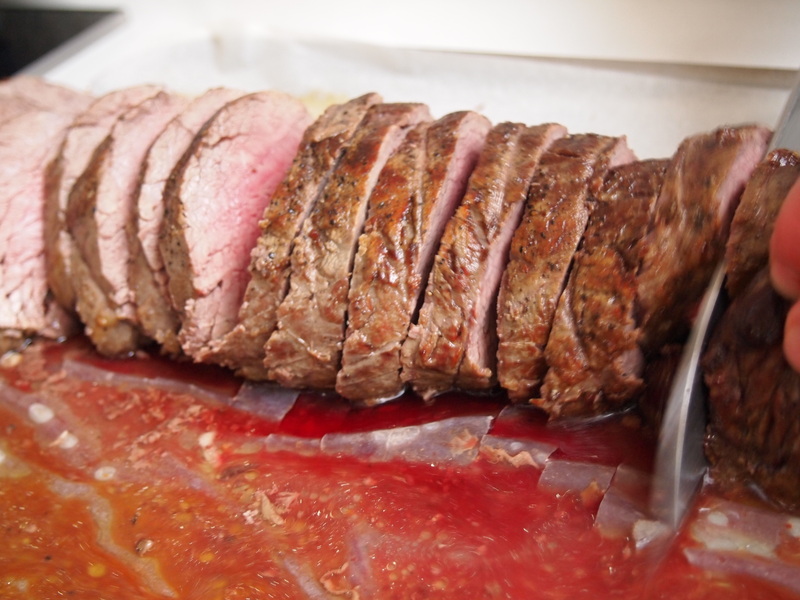 Remove the meat from the oven and let it rest, covered in foil for at least 10 minutes. Once the meat has rested, remove the string and carve into thick slices. To serve, place some of the sauce onto a large platter and spread to cover the base. Layer the beef slices on top of the sauce, slightly overlapping. Pour more of the sauce over the beef and serve the rest of the sauce separately at the table. Just made that red wine sauce & it is f…ing amazing! When do I add the mushroom please? Hi Leila, Thanks for pointing this out – the mushrooms go in at the same time as the other vegetables. I’ve amended the recipe. I’ve only just discovered this recipe for the sauce and I seriously can not believe how well it turns out. I’ve tried many versions of red wine sauce and have never been overly thrilled with the result (and I’m a reasonable cook). I’ll definitely be adding this to my repertoire. Thanks, Jenn and so glad you enjoyed the sauce.